Donations are closed. We raised $11,270 for the protesters, and I’ve been told that they’re in good shape now, with our donations and others they’ve received in the last 48 hours. So thank you everyone, this was quite remarkable. John, Joe, Chris, Gaius and Mirth. UPDATE: 3:50 PM Wed ET $9,881 raised so far – The first gift of $8,597 has just been wired to the protesters- your money is having a real immediate impact. Thanks and keep it coming! Please click the donate button to buy water and supplies for the pro-union protesters occupying the Wisconsin state capital. 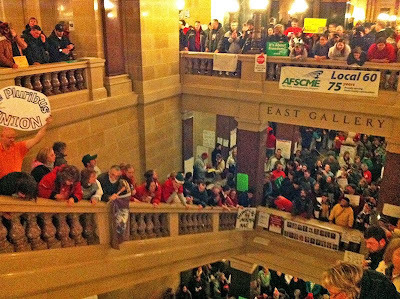 I just talked to my friend Ryan, who is in Madison with the pro-union protesters occupying the state capital building – Ryan is actually in the protesters’ war room – and they need supplies, fast. I’m asking if you folks could donate, whatever you can (even 5 bucks helps), to pay for supplies for the demonstrators, starting with water. Ryan just sent an update – the entire hall has apparently erupted in shouts of “shame!” directed at the governor’s office. Ryan says it’s the loudest it’s been all day, so things are definitely picking up. Here’s a photo Ryan just took sent over. Initially I had called Ryan to see if they needed pizza (Mirth’s idea), but apparently they’ve got all the pizza they can handle. What they do need is water. They also need some other supplies. So what I told Ryan I’d do is post the list of what the protesters need (see below), and then ask you folks to donate money via PayPal that I can then get to the folks in Wisconsin. It’s the most efficient way of helping out. I’ll keep you posted on how much folks have donated. WE ARE RUNNING VERY LOW ON WATER. 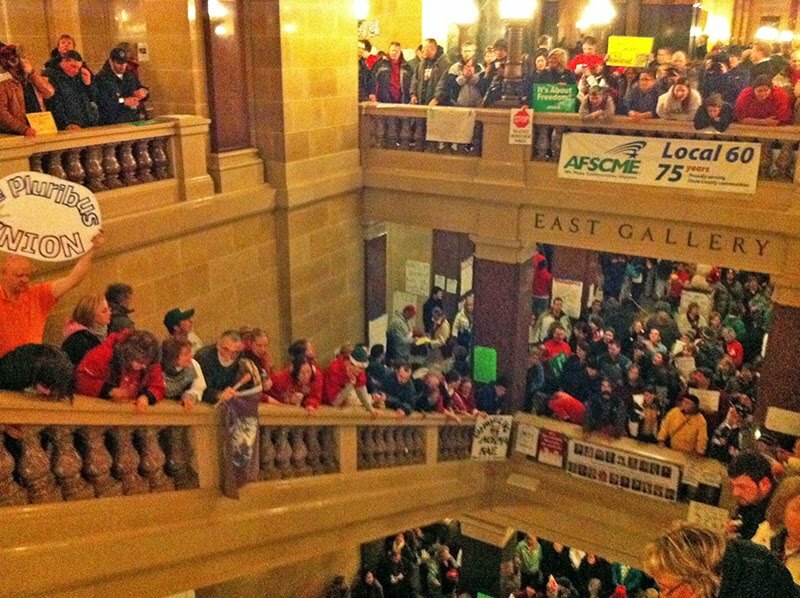 Click the donate button to buy water and supplies for the pro-union protesters occupying the Wisconsin state capital. Donations are not, to the best of my knowledge, tax deductible, and we at AMERICAblog won’t be taking a cut. 100% of the donations will go the protest organizers in Wisconsin. They will then buy the actual goods they need.